Rick Yancey returns with the sequel to The 5th Wave, which followed Cassie's fight for survival after the fifth wave of an alien invasion. Brave and intuitively skilled, Cassie outsmarted aliens who had overtaken teen bodies. To protect her brother, she didn't let anything stand in her way, until she met Evan Walker, who saved her on the road and appeared like the perfect guy. Of course, she realized by the end of the book that Evan wasn't what he seemed, but it was too late for Cassie. She was already in love. Now, we pick up with the survivors, including Ringer, who leads the way toward changing the future. 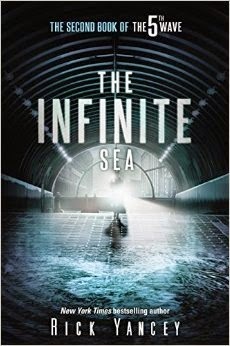 The Infinite Sea doesn't begin with the continuation of Cassie's story; however, readers are now led from Ringer's, a minor character from the first book, point of view. It was extremely confusing to figure out who was narrating the beginning of the book because I expected Cassie, but quickly, Cassie is referenced in the third person, so it took a few chapters to realize that Ringer's character was going to be the focus. This isn't a bad thing except readers spent an entire book growing with Cassie, so it was a shock to realize her story wouldn't be as vital. Ringer, however, is an interesting character as she tries to protect Teacup and be a leader amongst strong characters in Cassie and Ben. Going toe to toe with Cassie lends itself well to fiery dialogue, and her perseverance kept the plot moving forward. Cassie does get her own sections where we find out more about Evan Walker, who is pretty much being help captive by a teenage girl named Grace, but it is Ringer who carries the majority of the sequel's action. Once you accept Ringer as a credible narrator and follow her through her personal trials, she becomes just as important as Cassie to save the world. After moving past the brief confusion at the beginning, the novel's continuous action scenes are enough to keep you rapidly flipping pages. A swift, exhilarating sequel with two equally impressive female leads.